While culture is often described as a product, we are interested in the definition of culture as a process, in the relationship with cultivation – to grow that which is desired while gradually removing that which is not desired. Culture, in other words, as a verb. This activity the shared work of many people and many generations who must work together to discuss what is to be cultivated and how. 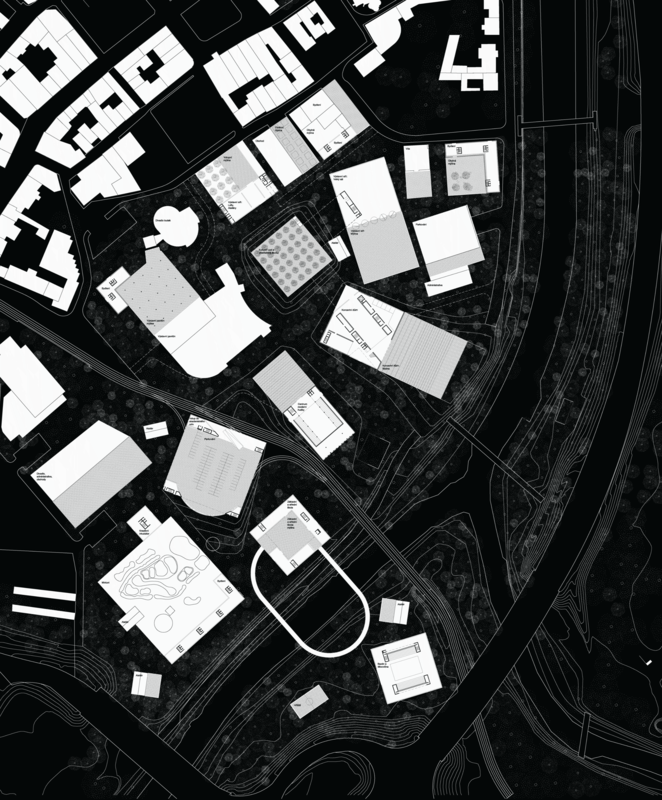 For the site, we propose three types of spaces related to culture. The first condition, a space for exploration, we term WILDERNESS. The second condition, the space of provisional community, we term CLEARINGS. The third condition, the stable spaces dedicated to the harvesting of ripe cultural projects, we term ROOMS. We argue that cultural activity benefits from access to these three distinct spatial conditions. First, culture is practiced through free play and discovery. This requires a space apart from the demands of intensive production and performance, a space in which exploration is first allowed, and then encouraged. Second, culture requires a place of interaction – spaces of community that move beyond a radical individuality, where common languages can be developed, where ideas can be exchanged. Third, culture both requires and produces spaces of cultural interaction that have developed into types that are recognizable by all: types such as the theater, the museum, or the concert hall. Through their stability, we are able to connect these types through time and space. 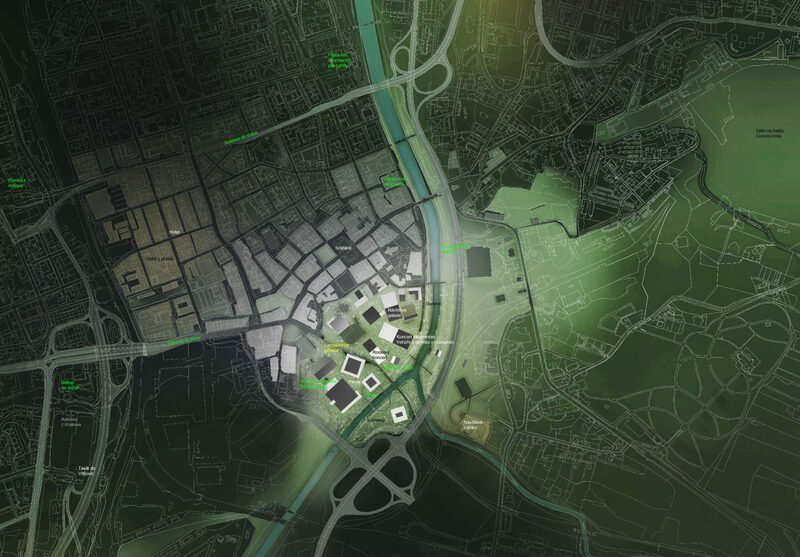 This proposal, then, can be seen as itself a kind of culture – and an experiment to grow novel urban conditions and contemporary ideas of public space. 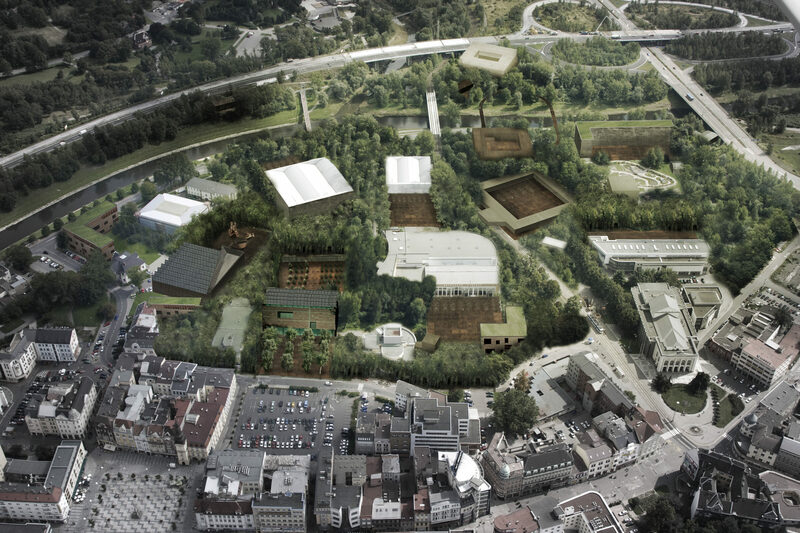 The combination of such radically different types of space cultivates an attitude of cultural exploration in which not just trained artists, but all the people of Ostrava, indeed all the people of Europe, can participate in the invention of culture. Healthy, natural forests can take hundreds of years to develop. To cultivate a Wilderness on the site is then to make a commitment to the long term life of the site, to, as a first step, optimistically imagine a long and healthy future. 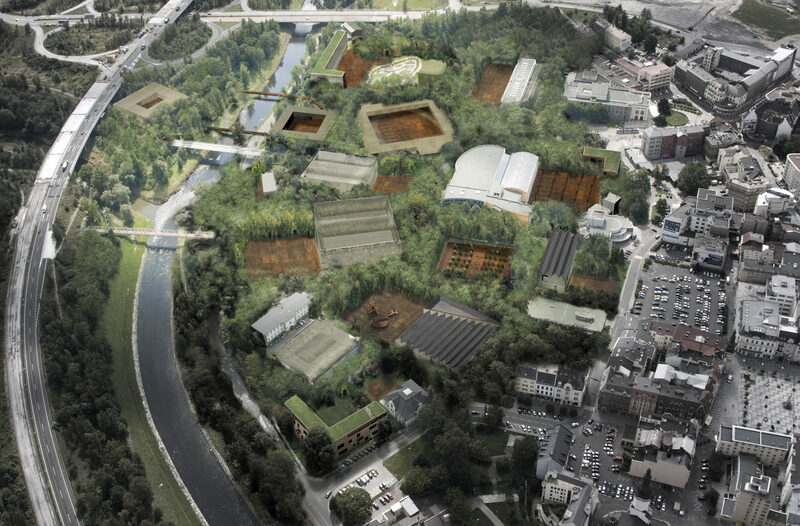 Most importantly, the Wilderness establishes a habitat as the primary condition of the site; a home for plant and animals native to the region, but also for the people of Ostrava and Europe. By bringing a diverse range of activities and people to the site, the Wilderness immediately inverts the isolation of many cultural enclaves. The forest is a place everyone can love, a place to meet, to come together. As an alternative space to contemporary urbanism, the Wilderness erodes and obscures borders rather than creating them. A confusing and restrictive web of connecting streets and walkways is rejected in favor of a de-differentiated ground that absorbs all these activities and more. This process can begin Immediately: All areas designated as part of the forest can be cleared while existing trees are preserved: asphalt can be ‘Hot Recycled” and reused for paving and repairs in other parts of the city, while the concrete can be pulverized and added to the soil. Once the site has been cleared in this manner, planting the site with clover (the tilling of which will add nitrogen and nutrients to the soil) will occupy the entire site and serve as a notice of a transformation. Next, a plant nursery will be created in a designated area on site, providing for an ongoing source of new plant material as well as educational opportunities for students and children. By 2015, The Wilderness will be well under way, and the planting of trees and management of the existing, nascent forest can be another event on site. Families who planted a tree together while visiting the city during 2015 may wish to return years later to see how it has grown. Vitruvius, Ten Books on Architecture. If the undifferentiated Wilderness is a space of excess, of abundance and life, of density, it also allows for the creation of the second type of space through subtraction: the Clearings. As Vitruvius pointed out over 2000 years ago, the clearing creates a common space, a space differentiated from its formless context that can become the collective space of communication. These clearings will be defined first as the absence of Wilderness, and second by the presence of “Carpets” – a hardscape treatment of the ground plane that maintains the clearing and provides a source of flexible, technical back up (outlets, controls for lights and sound, etc).Most of the clearings would most obviously be programmed by the adjacent Room, but they can also become a shared resource that helps bind rooms together. The buildings are called Rooms because what is important is their basic sense of enclosure. The interior of many of the Rooms is conceived as either hollow, or occupied by one or two large objects that define the building type (symphony hall, black-box theater, etc) and leave a remainder of circulation between the internal object and the exterior, volumetrically simple shell. This margin of excess facilitates the access strategy and creates flexibility. As is the nature of the Rooms, interface between the interior of the Rooms and the other spatial conditions of the site is precisely controlled. Relatively blank from the exterior, each Room should have several large apertures connecting interior and exterior where the interior objects meet the borders of the Room. This both creates a lantern-like sense of mystery about the interior of the objects, and for the potential opening up of interior performance spaces to the exterior Clearings or Wilderness. The stage of the Modern Music Center, for instance, faces the interior concert hall, but can also be opened to the MMC clearing, allowing for outdoor concerts.